The purpose of this blog post is to provide context for how and why transportation professionals do so much work surrounding the automobile. Further, the role of consultants in the transportation world will be discussed. And finally, example transportation projects and their relevance to the general populous will be explored. Most humans reside in a City. People congregate in cities based on three primary arguments. 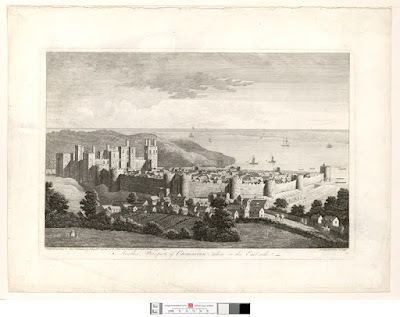 Some experts claim cities were founded on a militaristic basis, because a consolidated and walled city is easier to defend. Others say cities were created because humans are social in nature; and therefore, we inherently like to live together and cooperate. Lastly, cities may be founded because of economic reasons. For example, coastal cities are natural trade hubs for their ability to transfer coastal-shipped goods for land-shipped goods. And since cities attract a dense concentration of people, they also induce transportation trips; and thus, the traffic of people, vehicles, and freight. Or crudely put: cities create traffic. 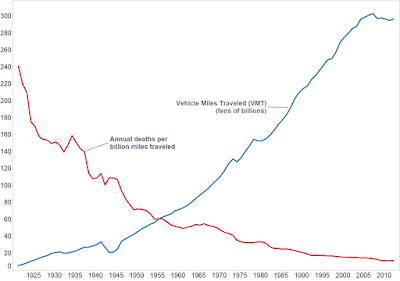 Cities and traffic itself were both radically changed by Industrialization. Not only were goods easier to produce, but now easier to move. And people desired to get around by other means instead of by walking or horse-drawn carriages. Technological innovations in the late 1800s provided electric-powered street cars providing a relatively cleaner, faster, and more reliable means to travel across the City. For example, land developers in Portland not only built housing, but also laid rail and operated street cars as an incentive for future residents to live in their new developments. But while this type of development was profitable at the time, industrialization eventually created the marvel which most Americans adore today, the automobile. While Henry Ford did not invent the automobile, he invented the assembly line decreasing the cost of production enabling every middle-class American to own a car. The middle class loved cars because they provided superior mobility as compared with the fixed route nature of a streetcar and the seemingly high maintenance that horses required. The automobile's rapid popularization in America changed the urban fabric of cities and modified people’s ability to make transportation mode-choice decisions. People could now travel when they wanted, where they wanted, and the tool was affordable. 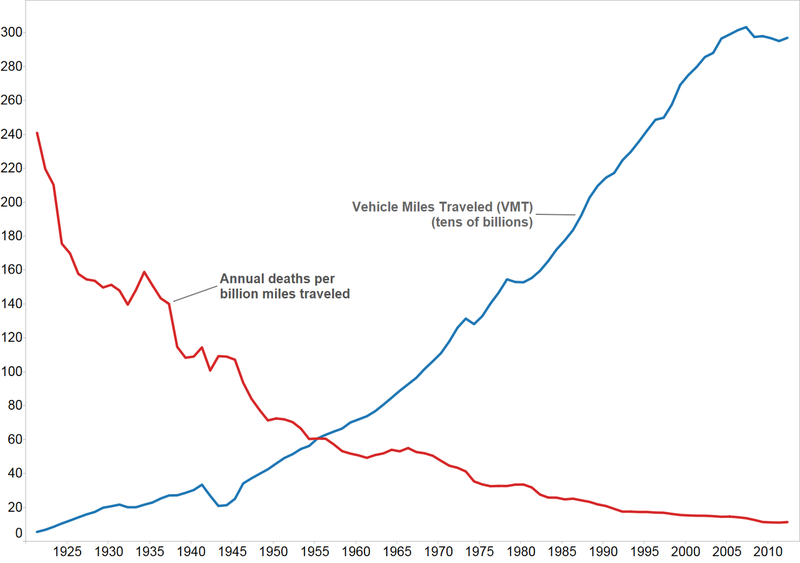 Unsurprisingly, automobile sales and vehicle miles traveled rose at a staggering rate starting in the 1940s to present. To respond to this increased traffic, devising a method to manage traffic became needed, and so traffic control devices were invented. Traffic signals were first spotted in the late 1860s in the United Kingdom (UK) to manage horse drawn carriages in busy downtown areas. 1915 marked the year of the first stop sign, which was invented in Michigan. The Roundabout was seen as early as the 1900s and modern roundabouts became popularized in the 1960s in the UK. Lastly, pedestrian signals were invented in the late 1930s. As the technology of cars improved, the car’s speed also increased, and therefore new infrastructure beyond traffic control devices was needed to respond to technology innovations. 1956 marked the signing of the Federal Aid Highway Act by Eisenhower. This $215 Billion dollar act was the largest 10 year public works expenditure at the time, and was expected to build 41,000 miles of highway. The act was designed to provide 90% federal funds on a highway project, where states were required to raise 10% of that money. (Currently, a 50/50 split between federal and state monies is becoming more typical). Anyway, these funds successfully created vast expanses of the highways and interchanges. In addition to the inter-city highway network we utilize, these freeways also transformed the downtown area of cities. You may observe how a highways often run through the middle of American cities, which was the result of a growing desire: people wanted to travel when and where they wanted. Eventually, the high community impact of these highway plans was recognized and citizens began to reject these projects. For example, there were plans to build a highway on Division Street in Portland, which was called the Mt. Hood Highway, which would provide people an expedited route to commute between Mt. Hood and Portland. If you look at the existing highway cutting through the middle of Portland, you may have noticed some highway stubs on the overpasses; these were meant to connect to this new highway. However, enough people in Portland opposed this plan to the point of rejection. Interestingly, the money not used for this highway project was transferred to the first light-rail line in the Portland-metro area: The Blue Line (Also constructed with 90% federal funds). 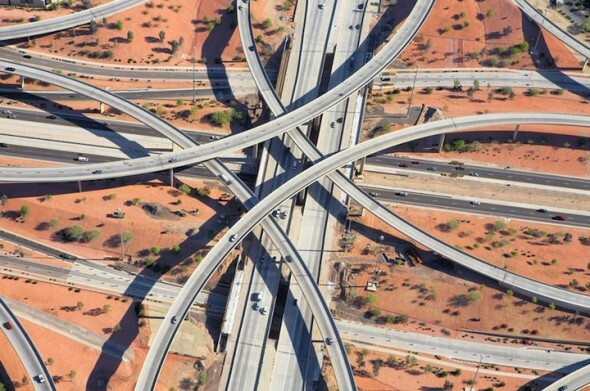 Among other things, these failed highway plans raised the question: “how should we plan cities?” In other words, how do we plan cities to meet the complex needs of people, employers, and accommodate future growth? Let’s remember why people live in cities again. The militaristic reason is now outdated, but there are still economic and social reasons for people to live in cities. For example, people like to live in different parts of a City. Some like the peace and quiet of the suburbs. Some like living in the inner-city in close proximity to a dense concentration of amenities. Some hate cities and choose to live in the rural area. While a person’s choice to live in or out of a City is social and economic, transportation professionals can influence that decision too. For example, the downtown area has residential housing primarily in the form of apartments. The cost per unit is typically more expensive than a house in the suburbs due to the close proximity to downtown shops and major employment centers. While you may pay more to live downtown, you don’t have to take time to travel as far and therefore the actual cost of living downtown may be reduced due to the hidden savings you incur. The cost of living in the suburbs is generally inverted to living downtown. In the suburbs, there are fewer amenities close to your residence, and you pay more to travel into major employment areas, but the cost of land is inexpensive compared to a downtown environment. In summary, there are economic and social trade-offs for where you live in a City. In some ways, transportation professionals influence the usage of the roadways in our cities to increase or decrease these costs, and can determine whether a road is a large highways or a small local road. Professionals also help decide the zoning density in an area. So, they do impact these social and economic costs. In particular, this next story involves projects typically done by transportation professionals which influences the width of roadways or urban form. Developers constructing single family home subdivisions is a classic suburban type development which can be found in many metropolitan areas surrounding dense cities. 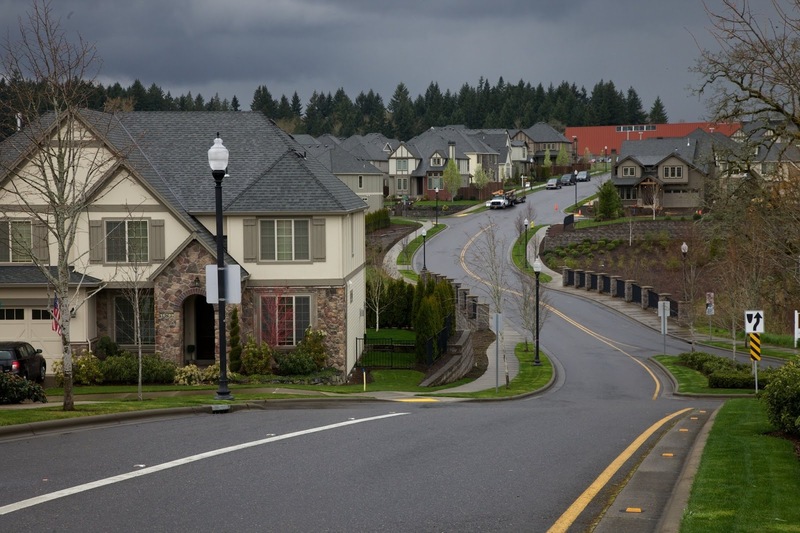 A natural question is: How did a grassland become a planned single-family home community? The process most likely began with population growth projections. These County forecasts are then converted into where people are living and working. Afterward, these projections are further translated into a transportation demand model to understand where people are coming to and fro. These models typically assume all roadway users are using an automobile. So therefore, the locations and sizes of roads are coarsely identified. However, more specific plans are needed to refine how wide streets should be and where they should be located to accommodate travel in an area. An area master plan determines roadway locations, the density of development, and where amenities should be located. In the transportation realm, the road’s size and cross section have been generally determined by the Washington County design standards, which typically reference design policies established by the American Association of State Highway Transportation Officials (AASHTO). The reason roadways have to be built wide and curves restricted to a specific radii, is also based on a design vehicle, which was last updated in 2001. However, even though there is sufficient evidence indicating wider roads are not safer than narrow ones, there is no active mechanism to overturn the AASHTO Greenbook. The Highway Safety Manual which is also published by AASHTO unfortunately does not prescribe an ideal “Safe” roadway. But instead can compare the relative safety of roadway scenarios. For example, there is an expected crash quantity difference between a roadway with a 1’ vs. a 6’ shoulder. In summary, using the AASHTO guide, the Washington County design manual, and input from the public, the roadway network’s widths will be determined. In many ways, the area’s transportation plan reflects the “Push and Pull” of a person’s choice to live in a part of a City. The person’s choice to live in a suburb vs. a City being a “Pull”, and the decision to establish a particular development's density in an area is the agency’s decision "Push” decision. In summary, this is a good example of how transportation professionals can become involved in project work in an area-master plan. The plan begins with creating a transportation demand model. Then area master plans are performed, which eventually forms the roadway locations and widths based on the standards at the time. The last step is for an engineer to design and build those specifications. Like the nationally recognized AASHTO greenbook mentioned before, national design guidance has a huge influence on what infrastructure is permissible in the United States. Transportation professionals will become involved in the national community, to work on such documents as NCHRP 672: Roundabouts, an informational guide. This document provides a snapshot of the best practices to plan, engineer, and operate roundabouts in America. This guide provides information on contextual appropriateness, operational performance, and inscribed diameter widths of roundabouts. This means that some roundabouts may not fit in an area if there right of way constraints. And if there was different documentation, roundabouts might fit in an area, but perhaps with other safety- or operational-related consequences. Further, not being able to install a roundabout also influences what traffic control device should be installed, which is perhaps a reason why there are very few urban roundabouts in America. I’ve outlined why cities exist for primarily economic and social reasons. Based on these reasons, we are a part of cities and contribute to them, which we do so in the form of our dollars but also in the way we choose to live. Sometimes the choice is easy (economic), and sometimes the choice is more blurry (social). Cities are also locations where traffic can occur which is primarily caused by the automobile, and thus we have a job. So much work we do glorifies the Automobile, from the ability for every American to operate one, to the infrastructure providing every American to drive 65 miles per hour across the country. While the rules of why we build roads wide and fast have been established, transportation professionals can still influence the contents of these documents. We can have an impact on how cities form based on what we know. It is possible to change.